Need to clean out after the holidays? Rent a dumpster from Bob Sanders. 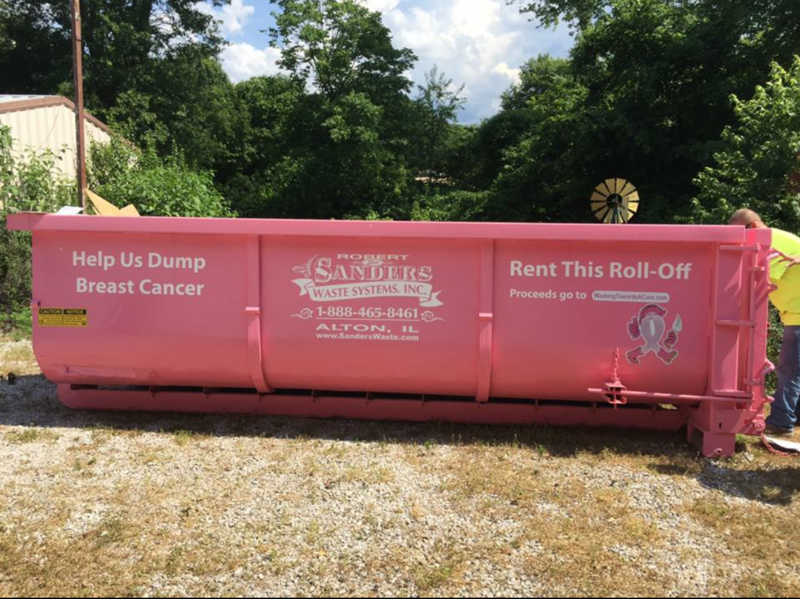 Request the pink Working Towards a Cure dumpster, and you will be helping those battling breast cancer! Great things are happening, and you can join the fun! Opening Ceremony starts at 9 a.m.
Maybe a cupcake will help! A cupcake? Nope, not the baked kind; we sell cupcake shaped potholders in an assortment of designs. 100% of the proceeds go to Working Towards a Cure. Wanna Help us break a Guinness World Record? Our goal is to make the world's largest bra ball! Yes, an at least six foot ball made entirely of BRAS! We need you to save all your old bras and either drop them off at Julie's, save until the Bra Walk or we're trying to get businesses to allow us to put out collection barrels. We've asked for a judge to come to the Bra Walk on October 5th, so we can get immediate confirmation! Please join in the fun and be a part of the record!!! !